As a boat dock, and sea wall construction company in the Marco Island, Naples, Fort Myers & Cape Coral Area. we’ve seen plenty of people dock boats the right way and unfortunately we’ve seen the wrong way. 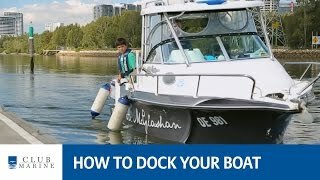 We here at DSI want to provide some great tips on perfectly docking your boat. There are lots of different boat docking situations that will need more in depth analysis. However, we have some great tips on how to dock your boat that can take away some of your jitters. You’ll feel less like an inexperienced rookie and more like a seasoned vet! The number one rule of docking a boat: Never approach the pier any faster than you’re willing to hit it. It may sound funny, but make sure that if you do make a mistake it’s not a rate of speed that will do big time damage to you boat not to mention your ego. Your boat speed should be managed by using a series of controlled coasts powered by small bursts of power. This is done by going in and out of gear. This also prevents your from building too much momentum. For twin-engine boats, be sure to use one engine at a time. You can lose control if you build up too much momentum. Judge wind and current when approaching the dock. If the wind and or current are pushing you towards your target, a shallow angle should be used. This will prevent you from striking the dock with the bow of the boat. A steeper approach is needed If the wind and/or current are pushing you away from the dock. As your boat closes in on the dock approximately half a boat length, swing the wheel over hard to starboard (away from the dock). Being very familiar with your boat is key, especially in how it pivots. This knowledge comes with time and practice. If you rush your turn, and you won’t end up parallel with the dock. If you wait too long and miss your window, well, you may want to brace yourself for impact! Bump the engine into gear (as the wheel is already turned), this quick burst will to push the stern to port. The bow will swing away from the dock, to starboard. At this point your boat should be moving parallel to the dock. As the boat draws near to the dock, turn the wheel all the way back to port, and move the engine into reverse (if you have twin engines, use the engine farthest from the dock). This will accomplishes two things: you will notice your headway has stopped and the stern of the boat will be pulled towards the port side and closer to the dock. Once the boat in no longer moving in a forward direction, shift to neutral. As the boat continues moving parallel up to the dock. You can then safely catch hold of a piling or line. Don’t be afraid to abort. Hey everyone needs a “mulligan” once in awhile. If the approach is getting away from you, circle back for another try. Better to have have a damaged ego than a damaged boat! Enjoying your boat in the Florida sun is always a lot easier when you have the confidence of knowing you can dock anywhere without any mishaps. Leave a message if you have any tips to share.